They told us Jason moved to Wisconsin but it’s not true. He tried to open some biscuit dough by himself. The explosion blew off his face. He still lives on Westmore road with his family but he will never come outside. Except on Halloween. He doesn’t even need a costume. Ha! This is true! 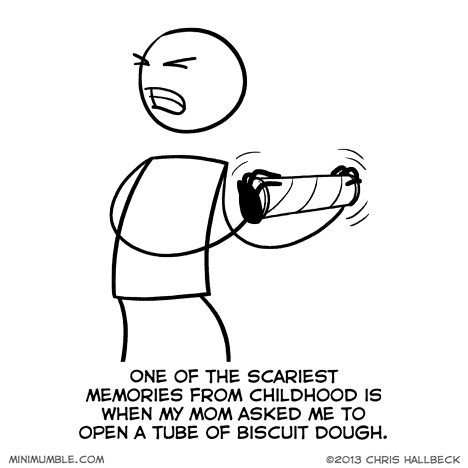 I am a grown man, and my mother waited for me to arrive for Thanksgiving and Christmas to ask me to open the biscuit tube. No need to twist it – just smack it on the edge of the counter.